Most of us have lived and worked in a single country and don’t think anything of being paid in anything other than that country’s currency. But we now exist in a global village, and that means that we have choices for our money supply. This is the area that Bitcoin and its ilk are now operating in. The brave new world of independent money is upon us, and this time I think it is going to take hold. We tried this before with all the digital cash variants in the mid-1990s: a combination of the Internet boom and the rise of internationally accepted credit cards nipped those efforts in the bud. One good thing to come from all of that work was Paypal, which while not new money is the default way that many online transactions happen. 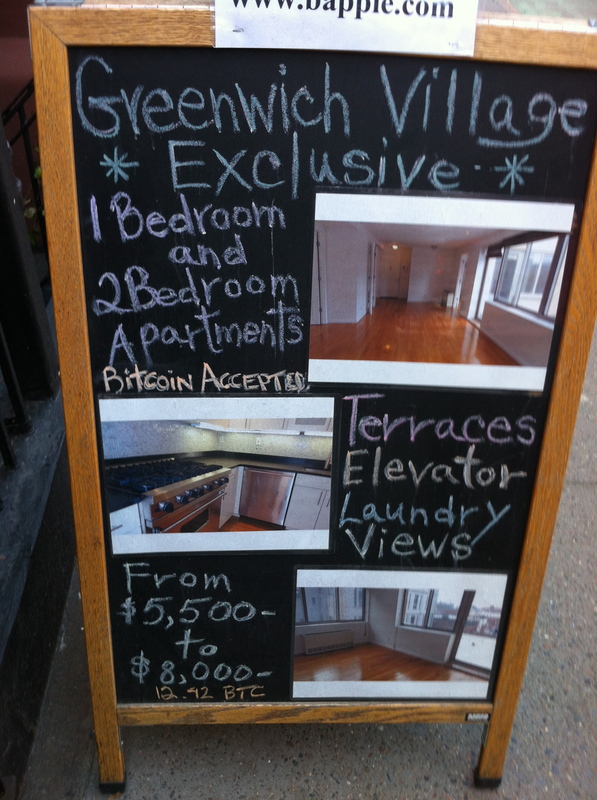 You have people asking to be paid in Bitcoin for all sorts of things now, including over-priced New York City apartments (see the photo above), vending machines, restaurants, overpriced electronics and other mundane activities. It is somewhat counter-intuitive, but the same thing happened in the early Paypal days too. Finally, these new efforts have important payment gateway applications, and that is what I want to really focus on. While Bitcoin et al. are getting a lot of attention for their seamier side, what is really happening is that they are attacking the overpriced payment transfer business. Look at how much it costs you for an international money order, or a wire transfer? What if we could drive these costs to near zero, and make it easier for anyone to pay anyone? That is the ultimate benefit of Bitcoin. When I get paid by Paypal, it is in US$ and the funds don’t stay in my account for very long. I look at that account as a mechanism to collect money that is ultimately destined for my ordinary business checking account, which is where I pay bills and pay my ultimate salary. In the past, when I have worked for non-US clients, there has always been a dance about the process of being paid: sometimes the client has a dollar bank account that they can draw a check on, other times I can get sent funds via Paypal. And sometimes people ask me to bill them via their credit cards. Wouldn’t it be easier if I could have a service that handled these transfers easily and cheaply and reliably? Bitcoin might not be the ultimate place that I will do my banking. Given its wide swings in exchange rates, I am not sure that I would trust having much of my funds in Bitcoin at the moment. Ideally, I would want a system that could accept transfers from a wide collection of currencies, including dollars and Euros, just to make sure that I cover as much of my potential audience as I could. I started looking into Ripple, which has a more inclusive philosophy, but its universe is also more complex to evaluate. Unlike many of my columns, I am still doing research here. I don’t have any definitive answers, and these new forms of money might go the way of their older virtual cousins in another year or two. But it is interesting to watch what they are doing nonetheless. I am following this quite closely as well. We own a vacation home in Costa Rica, and every time we need to send money – for maintenance, to pay taxes, whatever – it’s an expensive and painful process. As we become more global something has to make this better that hoping your US bank opens branches in your foreign nation of choice, and offering no-fee wires to those accounts. “better than”, not “better that”…. There are two reasons entities want to follow the money. 1. Government want to follow the money so they can tax it. Note that failure to report illegal income on your US tax return is illegal. 2. Banks want to make money on it. For the past few years, banks have been paying fractional percents – like 0.025 percent – interests on deposit accounts while charging 12 to 20 percent interest on credit card debt, in addition to the 2 percent they take on every use of a credit card or debit card. It is not practical to keep all of your money in cash. If you want to use a bank to hold your money, they need to offer a reasonable return for the use of your money until you need it. But it would be great to have a totally frictionless (i.e., free), totally private, and totally secure system for moving money from person to person and from company to company. 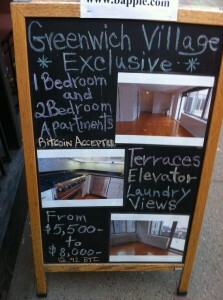 Bitcoin offers that (well, maybe not the secure part). And the valuation of each bitcoin reminds me of dutch tulips and tulipomania. Paypal offers some of that, allowing you to “hold” money in your Paypal account and then use money your receive via Paypal to pay others via Paypal. Companies like Uber offer some of this, matching drivers and riders in as seamless fashion, and then moving the money automatically. Of course, they take a nice percentage, which is why their valuation is $3.5 billion on an annual revenue of $125 million. What’s next. Hopefully something better.